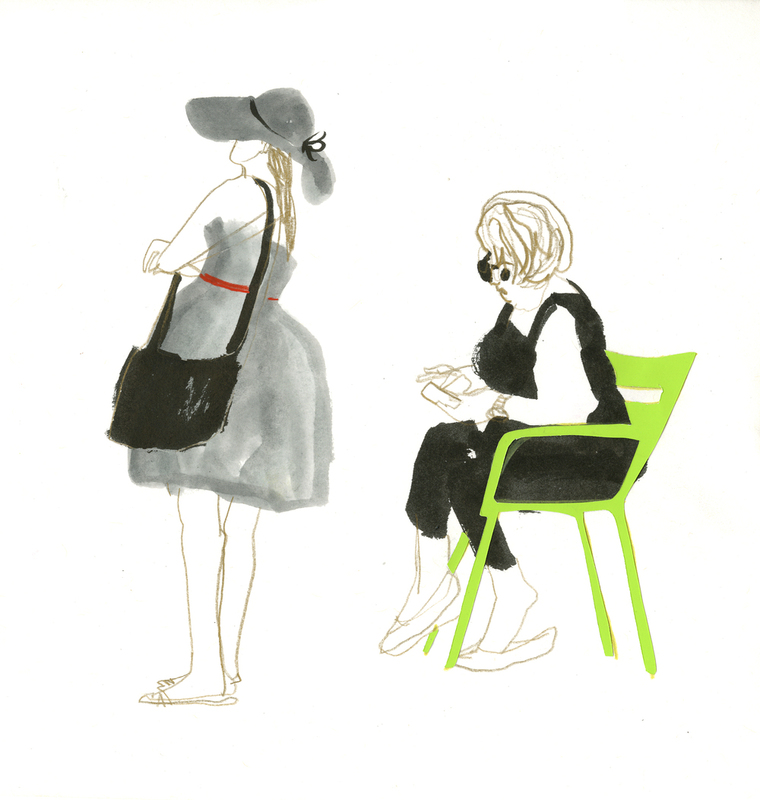 I found this drawing of people waiting to get on the carousel while I was going through a big stack of old drawings. I remember feeling so excited about the thumbnail, and then feeling distinctly unhappy with the drawing itself. I've left the thumbnail in the corner so you can see for yourself (click to see it larger). Looking at it with a some distance, I'm not sure why I was so upset. It's a good reminder not to be so hard on things when they don't turn out quite how you expected. It's been a few weeks since I've posted — let's call it a spring break — but when I saw that today was the birthday of John James Audubon, I thought it would be a perfect time to post some drawings I made of Canada geese over the winter. It was up in Mystic, CT, and snow was on the ground. I guess snow is nothing for geese that range as far north as the Arctic Circle. They were scrabbling around with their bills in the snow, and generally standing around looking big and a little goofy. Our feathered geese friends here in New York have to watch out for the Parks Department, since it's the season for the city to cull their population. For super cute goose news, click here. I am starting the new year with a drawing I made recently at the Japan pavilion at Epcot, just for myself, for study. Dictionary.com tells me that the definition of study is "a personal effort to gain knowledge." I thought it would be fitting because as an artist, I want everything I do to begin with a personal effort to gain knowledge. "From the time I was six, I was in the habit of sketching things I saw around me, and around the age of fifty, I began to work in earnest, producing numerous designs. It was not until after my seventieth year, however, that I produced anything of significance. At the age of seventy-three, I began to grasp the underlying structure of birds and animals, insects and fish, and the way trees and plants grow. Thus, if I keep up my efforts, I will have an even better understanding when I am eighty, and by ninety will have penetrated to the heart of things. At one hundred, I may reach a level of divine understanding, and if I live a decade beyond that, everything I paint-every dot and line-will be alive. I ask the god of longevity to grant me a life long enough to prove this true." – Katsushika Hokusai, postscript to One Hundred Views of Mount Fuji [translated by Carol Morland]. Sorry for the long hiatus, I'm not sure what happened! I think I was art-hibernating for the last month or so. But the spring weather has awakened my art blog impulses again! My class is planning a trip to Paris in the summer, so I've been looking back through my sketchbooks at my last trip in 2006. I thought I would share a few drawings I made there. The Louvre was definitely a highlight of the trip. I love the Metropolitan Museum of Art here in New York, but the Louvre is like the Met on steriods. It's probably three or four times the size—like art-heaven! It can be intimidating, though, I won't lie. But I did calm down enough to make a few drawings in the European sculpture section. These lovely ladies were gracing tombs, and they seem to take the opposite approach to presenting themselves to posterity. The first was all piety, raising her eyes heavenward in humble supplication, dressed in rich looking clothes, but with an austere design sense. The other lay on one elbow, with an open book, smiling like the cat that ate the canary. I had to draw her because she seemed so modern. I can't wait to see the Louvre and these two ladies again! Dionysus, the Greek god of wine, revelry, madness, and ecstasy is a perfect figure for artists since he's all about unbridled license and a freeing from the normal constraints of everyday life and civilization. The cult of Dionysus were the first to try to transcend the existence of the flesh. During the rites, the initiates of the cult were supposed to actually take the god into themselves - to become the god. The theme of the mural was "change," and I wanted to depict something cyclical instead of a one-way transformation. Dionysus is called the twice-born god because he was born from both his mother and his father. His mother, Semele, asked to see Zeus undisguised, the same way he came before Hera. Zeus had promised Semele anything she wanted, so he reluctantly showed himself, in his least awful incarnation. Semele was immolated completely anyway, and Zeus couldn't do anything for her except to pluck Dionysus, then in utero, from her ashes. Since the fetus hadn't been fully brought to term, Zeus sewed him into his thigh, from which he birthed him a few months later. The death of Semele is on the left side of the mural, and Dionysus' birth is depicted on the right. In the middle is the ritual bacchanal (and death) of the god, who is sacrificed and resurrected yearly. Dionysus leads the procession of initiates, dancing in drunken ecstasy. The bull that is sacrificed stands in for the god. Strangely enough, Dionysus is both a celebrant and the sacrifice in the ritual.